I was very fortunate to find my love for two wheels at such a young age. It all started in my driveway, just outside the small town of Truro, N.S., about 25 years ago. I had no idea then where a bicycle was going to take me. All I knew was that I was hooked. I remember the exact spot in my driveway where I first learned how to ride without training wheels. When my dad knew I was ready. I remember him giving me a little push from the seat for momentum. I didn't know at the time, but that moment was when I realized what freedom was. I had no idea that day was going to be such a huge turning point in my life until many years late. Actually, until now, as I write this down. It was a love of two wheels. My love for BMX came later, but I knew riding a bicycle was for me. It was an adventure every time. It was a way to explore faster than my own two feet. Shortly after learning how to ride a bicycle I was on to the next obsession — motocross. I was five or six years old when I saw motocross for the first time. Mesmerized, the first thing I did when I went home was grab my bicycle. It definitely wasn't a dirt bike, but a child's imagination is one of the greatest things on earth. I made dirt bike noises with my tongue stuck out of my mouth. I made a number plate out of paper and scotch tape. I piled up a single mound of dirt in my mom's garden. That's when my bicycle became more than just a way to transport myself. It was a way to fly as well. I remember it being a fall day, after everything was picked from the garden. I grabbed my dad's shovel from the garage and built that first jump. Starting with just a six inch-to one foot mound of dirt, I learned to jump. The mound of dirt slowly got bigger, which meant I needed more speed than I could build in from the driveway. It also meant I needed to pedal in from the road. I would get my mom to stand at the end of the driveway for hours, watching for traffic so I could pedal in to the jump at top speed. Fast forward two years: it was my eighth birthday and the second big milestone of my life. One being the day I rode without training wheels, and second, the day I got my first dirt bike. I remember being woken up by my dad, who was eager to show me a surprise. It was a brisk May 5 morning, so I put on a jean jacket before heading out to the garage. Sitting there was a brand new Yamaha PW 80. That day would kick start five years of racing motocross. I still rode my bicycle every day when I wasn't on my dirt bike, yet still pretended it was a dirt bike. In the sixth grade I found my passion for BMX. A local youth centre opened in my home town. Cafe X-treme had a little cafe, a stage for bands to play at, and a skate park. A couple of my friends had gone and I was intrigued. I asked my parents if I could ride my bike there. The answer was a hard ‘no.’ I was too naive to realize what the older kids were doing there, but it wasn't a place my parents wanted me to be hanging out. With a whole lot of persistence, or perhaps just by being extremely annoying and asking every single day, my parents cracked. I remember getting into the skate park and not really knowing where to start. From my motocross background, I just started jumping stuff. Being a tiny 11-year- old kid, this got some cheers from some of the older kids. Just for being able to jump the ramps. I was hooked. I realized that day there was no right or wrong way to do BMX. I had complete control of what I wanted to try and to learn. Once again, it was another feeling of freedom. I became obsessed with BMX that very first day. I still had my love of motocross, but since both my parents were doing shift work, I didn't get to ride my dirt bike very often. With BMX I could do it every day after school no matter what. It was the perfect time for me to find a passion I could indulge every single day. 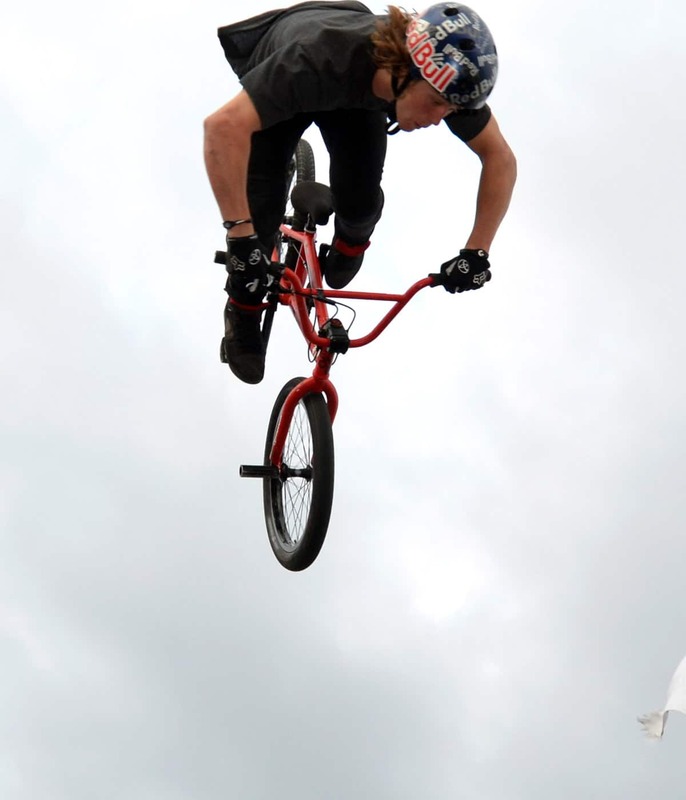 I was at the age many kids start getting into trouble, but I never found anything to beat the fulfillment BMX gave me. Fast forward another six years: thousands of hours of riding and a passion stronger than ever. I decided to ride my first Pro contest. The 2006 Vancouver Metro Jam was the biggest contest in Canada at the time. I initially tried to sign up as an Amateur, but there were only 40 spots available. Registration was by phone — on a first come, first serve basis — and the closest I got was 15th on the waiting list. The website specifically said if you don't make the registration for Amateur, do not sign up for Pro. I signed up for Pro. I told my friends, and no one thought it was a good idea, but I already had my plane ticket and paid my entree fee. I went out two weeks prior to the event just to ride some of the bigger local parks and prepare for the contest. Practice was the most intimidating thing in the world. If another Pro rider dropped in, I would jump off course, because I didn't want to get in their way. Qualifying rolled around, which was awesome because it was a jam format, only four riders per heat. I knew the guys in my heat, which helped the nerves ease up a little. After dropping in for the first time, I was just bike riding again, and qualifying went nicely. The results weren't posted until the next morning. I think I was one of the first riders to the venue the next day. I scrolled through the list, from last to first, looking for my name. The top 16 riders qualified for the finals. I could not see my name below the top 16. I thought I had missed my name and checked again before allowing myself to look at the top 16. Then the realization set in, my name was posted in ninth position. I was blown away just to make finals. I rushed onto the course with fewer riders now for morning practice. I felt like a kid on Christmas morning. I figured out a few more things in practice before finals. I was in the second heat of four. It was the best day of my life. I pulled everything in my runs and then for the first time, I got to watch my eight favorite riders compete in person. The final two heats were insane but my consistency earned me a solid seventh finish overall. After the awards ceremony, reality hit me. Five out of the six guys who placed in front of me had X Games medals, and I came seventh! I wasn't that far behind them. The next thing that crossed my mind was: maybe this dream of riding professional could be a reality.